Artist’s Textiles is a two part exhibition curated by environmentalist, artist and textile designer, David Bellamy. Opening 17 November 2018 at the Irma Stern Museum, University of Cape Town, the exhibition marks the launch of the Museum of Making and Tomorrow (MOMAT), a ‘thinking, making and communicating platform’. Vintage chair upholstered in hand-stencilled artist’s textile Thicket Garden - Seed Bomb, designed by David Bellamy, MOMAT. Photograph Martin Hahn. PART ONE: In the large gallery space, artists based in South Africa and Europe show their process in creating a textile (functionality) based on an artwork (non-functionality). Featuring work by Sanell Aggenbach, Jessica Dorrington, Ruan Hoffmann, Zayaan Khan, Louise Kaye, The Keiskamma Project, Cebo Mvubu, Heath Nash, Jo Ractliffe, Greg Stock and Karen Suskin. 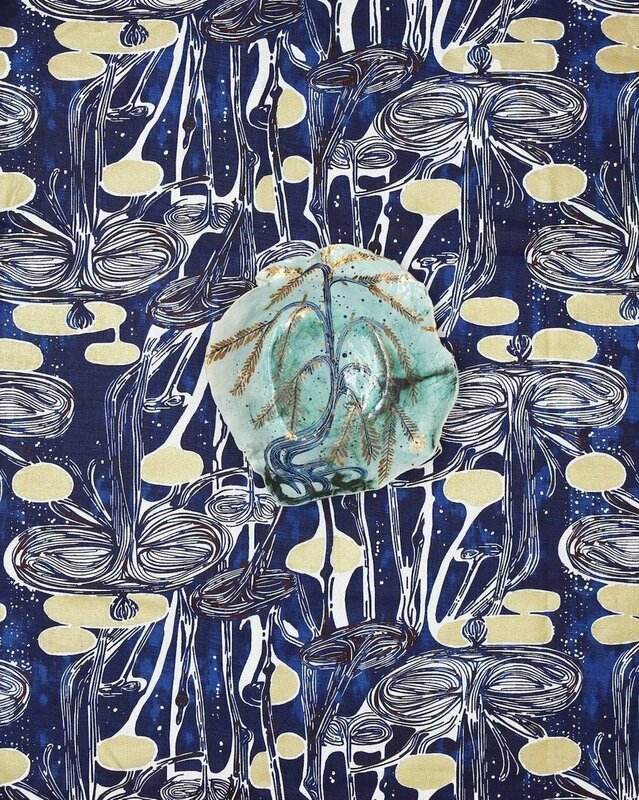 'Untitled' ceramic painting by artist Ruan Hoffmann on his 'Waterlilies' fabric. Photograph Martin Hahn. PART TWO: An installation in the smaller gallery arranges textile-based works, furniture and clothing, manufactured by David Bellamy’s artisanal textile studio, as 'a set from a film that has not yet been made'. Traditional fine art means of making, like stencilling, painting and linoleum printing, are used to produce the textiles. ‘A set from a film that has not yet been made’. Artist’s Textiles installation by David Bellamy, featuring friends Georgia and Lily. Photograph Martin Hahn..
MOMAT is established in order to incorporate within objects both environmentally (and thus human-socially) central problems and their resolutions, sidestepping arguing and polemics, and the futility of pointing out problems (but leaving their resolution to persons unknown). For example, textiles made of linen, printed using labour intensive methods and low toxicity water soluble inks can embody impact solutions in terms of: water cost, landfill, biodegradability, Volatile Organic compound production, worker health, unemployment, etc. Artist’s Textiles, Irma Stern Museum, University of Cape Town, 17 November to 8 December 2018.